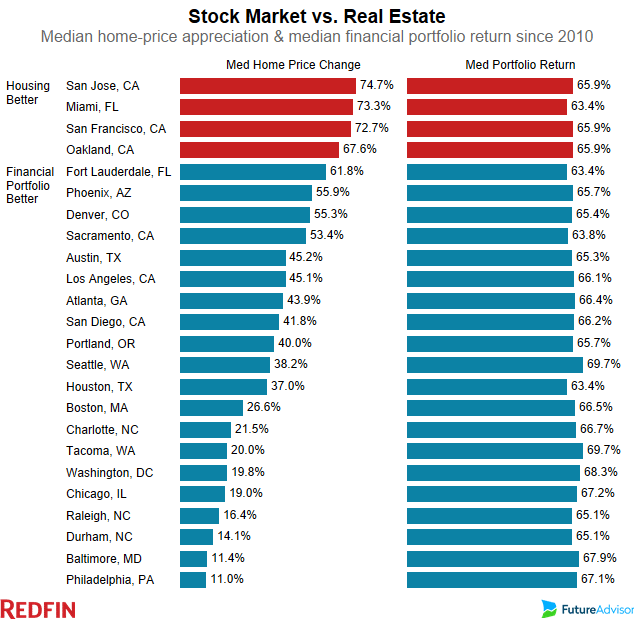 Redfin Study: Are Homes Or Stocks A Better Investment? According to Redfin's latest study of 24 metro areas between Jan. 2010 and May 2016, stocks have a greater return on investment than homes. The only four metros where housing showed a higher ROI were Miami and California's San Jose, San Francisco and Oakland. Although real estate is considered a strong investment, is it smarter to place your funds in stocks than in houses? According to a new study by real estate brokerage Redfin, stocks showed a higher rate of return than housing investments between January 2010 and May 2016. The Redfin analysis was completed with investment advisory firm FutureAdvisor and compared gains in home prices with returns on a median stock portfolio in 24 major metro areas. Because the analysis only included certain metro areas, the results can’t be extrapolated to every market. “A median financial portfolio earned between 63 and 70 percent since 2010 in each of the 24 metros studied” — this was a higher rate of return than housing in every metro studied except four. “These were all housing markets where prices skyrocketed and crashed the most during the bubble years,” said Redfin. “There are pros and cons to any investment, but real estate is unique in that it offers the advantage of forced savings through the monthly mortgage payment,” said Redfin chief economist Nela Richardson in a press release. In most cities, multi-family buildings, condos and co-ops had higher appreciation than single-family homes. The best time to buy in 2010 was December, with home prices appreciating 46 percent since then, compared to just 36.8 percent for homes purchased in June of that year. Redfin used MLS data on more than 730,000 property sales during 2010 across 24 metro areas. The company measured price appreciation by using the 2010 purchase price from county records and the June 2016 Redfin Estimate for all home sales, then took the median for each metro. Redfin required a minimum sample size of 20 listings for measuring appreciation by property type. FutureAdvisor conducted backtesting of user portfolios as of May 18, 2016, by using asset class-based returns from January 2010 to May 2016 to simulate a percentage return. The company then took a median percent return of the financial portfolios for each metro area.